Infibeam operates a business model about product platform infibeam.com and services platform, which is contributed to the Infibeam Web Services. Infibeam has resumed the operation of the newly setup registered incorporate office at GIFT City located in Gandhinagar. Gandhinagar office is spread across nearly half a million square feet of area. This location houses all the company’s data infrastructure. Infibeam has added Adani Wilmar to their group and merchants to their portfolio. 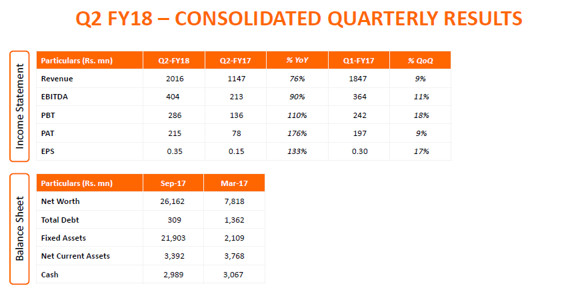 Consolidated Q2 FY2018 revenue grew by 76% Y-o-Y to Rs.2016 million, the increase in revenue was driven by robust growth in Infibeam Web Services. The EPS of the company has increased by 132% Y-o-Y to Rs.35. The service segment revenue increased by 264% Y-o-Y to Rs.1223 million especially on account of the large transaction volume processed on the platform and addition of new merchants. The growth margins of the company have improved to 4%. Product business now contributes to less than 40% of the overall revenue; this was earlier 70% last year. The company has focused on building up the Infibeam Web Services portfolio.The margins on the web services segment are 38%. The company has integrated the platform with payments with logistics with other value-added services to drive demands to become a one-stop solution to the clients. The company uses a lot of AI component in each of their services. The company offers payment solutions through their fully owned subsidiary CCAvenue. CCAvenue is the payment aggregator. It is one of the largest direct debit card engine, CCAvenue powers more than 80% of the pay e-commerce merchant. The payment platform can process across 27 international currencies, and it has got all the new age mobile payment like IMPS, EMI and all is integrated. CCAvenue did not have a significant presence in utility payments. Revenue of CCAvenue last quarter was about Rs. 50 Crores and this quarter it is about Rs. 53-54 Crores. The company has a strong logistic solution platform Ship droid to manage logistics for e-commerce industry player. .OOO top-level domain registry has a significant competitive advantage in the acquisition of merchant strategy. The company intends to leverage the.OOO domain registry to attract additional merchants to their platforms, which will be a very cost-effective merchant acquisition strategy. The cost of managing the .OOO domain for the year has been brought down to a fraction from current level. Infibeam has evolved from being a marketplace to mature Technology Company in the last ten years. The company is focused on offering cloud-based full-suite e-commerce platform, the small basic businesses, SMEs, large enterprises as well as recent government organizations. They developed multiple languages capability, multiple currency support, multiple logistics company integrations as well as many other capabilities to power e-commerce across the globe. It is estimated that procurements from GeM can be as high as hundred billion dollars a year for the central government. According to gem.gov.in, there are 40,000 sellers with nearly 2.5 lakh products over more than 950 product categories with more than 1.2 lakh orders that have already been placed and total transaction of more than Rs. 2000 Crores. The company will charge 0.5% as transaction fees. Infibeam’s share of the per transaction would be 6 to 12 bps. The International market for Infibeam is small; there is very large potential in the international market. The Middle East is the largest geography for the company. They have started their service in US and Europe as well. Saudi telecom has become an aggregator as well as a user of the company’s framework and the platform. The revenue contribution from international market is about 12% to 13% this quarter.